Life tends to throw you curve balls, and getting injured while you’re trying to focus on your fitness is definitely not one of our favs. It’s important to not let an injury get you down though. In fact, the best way to bounce back quickly from an injury is to not allow it to keep you down. Of course, you must follow doctor’s orders and rest any serious injuries. 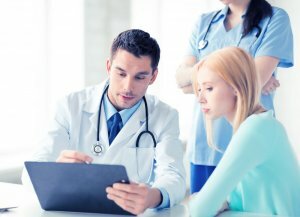 However, many medical professionals will recommend that when you are cleared for physical activity again you take full advantage of that time. This will allow you to bounce back better and stronger than you were before. Here are 4 tips to help you bounce back quickly and efficiently from injuries. We’re ready to get you back on the path to health and fitness right away! Sometimes, an injury might be as simple as a sprained ankle or sore muscle. While you may need some time away from the gym, it’s unlikely you’ll seek out a doctor if the pain is minimal. However, if you are at all unsure of the extent of your injury, always consult a medical professional. Knowing exactly what happened to you, as well as exactly what your injury entails will help you bounce back so much faster. Sometimes, playing the waiting game will only have you waiting even longer for your injury to heal. Once you’ve consulted a doctor and you are cleared for physical activity, one of the best workouts to start out with is aquabiking. Working out in the water allows you to enjoy the benefits of a high-resistance, low-impact workout. 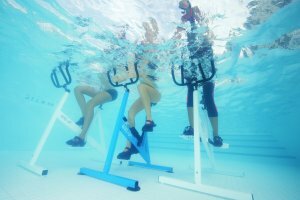 Aquabikes give you the opportunity to ease yourself back into a workout routine without seriously aggravating an injury on the mend. Be sure to listen to your body and take a break if you ever feel you’ve over-exerted yourself. It’s better to rest than to re-injure yourself and be out of the fitness game even longer. In addition, aquabikes are an excellent long-term investment. As your fitness level increases, you can utilize specialty equipment. Now is an excellent time to take the plunge, we introduced a monthly payment plan to make owning a wike-up! aquabike more accessible than ever. Whenever you decide to brave the gym again, or take on any other type of physical activity, a workout buddy is an excellent way to stay safe. Not only will a partner help make sure you are maintaining proper form, if you do accidentally aggravate your injury, they will be there to quickly get you the help you need. Be sure to drink plenty of water while you are on the mend. It’s always important to stay hydrated, but it’s particularly important when you are rehabbing an injury. Carry a large, refillable bottle of water with you so there is no excuse for missing out on your required water intake. You’ll thank yourself during those long, busy days when you don’t have time to run out to the convenience store for a bottle of water. So, there you have it! 4 great tips to get you back on your feet and feeling great fast! Did we miss your favorite tips for bouncing back from an injury? Get in touch! Get your Fitness Wike-Up! or push yourself and get the Performance Wike-Up!